← ‘Unite the Right’ leader Jason Kessler was an Obama supporter in 2016, backed Occupy! There are very important reasons why you don’t want to ever gaze at a solar eclipse, especially a total solar eclipse. Whether it’s a partial or total eclipse — solar or lunar — it’s not wise to watch them progress across the sky. On the purely physical level, staring at an eclipsed sun in the middle of the day is not healthy for the eyes. This is true even for the sun undergoing a full eclipse of its light. It’s actually dangerous to fix the eyes on a solar eclipse for any length of time, especially if you live in certain geographic regions of the world. KEY REFERENCES: For anyone who wishes to understand eclipses from an enlightened standpoint, the following two links provide some excellent historical perspective as well as significant health ramifications. Solar and Lunar Eclipses: Don’t Watch Them! Vedic astrologers in India have acknowledged that an eclipse is a fundamentally inauspicious event on the mundane level. Hence, they often advise their clients to avoid travel 2 or 3 days before and after the eclipse. These practitioners of Jyotish, as Indian astrology is known, also recommend against starting a new business or any other venture. Trying to conceive a child is especially discouraged as is the inauguration of any enterprise or entity. Hopefully, the reader gets the picture. When either of the two major luminaries in the sky is experiencing an eclipse of it light, there is a temporary interruption of the cycles. Life cycles, biorhythm cycles, growth cycles, even digestive cycles, experience a subtle disruption. This is also why the same Vedic astrologers strongly suggest that no meals be taken during an eclipse. Any eating or drinking ought to be done in small amounts well before the eclipse begins, unless medically prescribed otherwise. The intensity and angle of the sun is tied directly to the strength of the digestive fire in the belly. When the sunlight is blocked by the moon, the digestive fire is likewise dimmed and not burning as brightly to properly digest one’s food. While these various proscriptions may seem superstitious, they are not. They have been time-tested since time immemorial. Societies, both ancient and modern, have observed these recommendations with great benefit by averting unpredictable consequences. The following excerpt details the explicit guidance from a Brahmin priest in India that he gives to his spiritual community regarding eclipses. 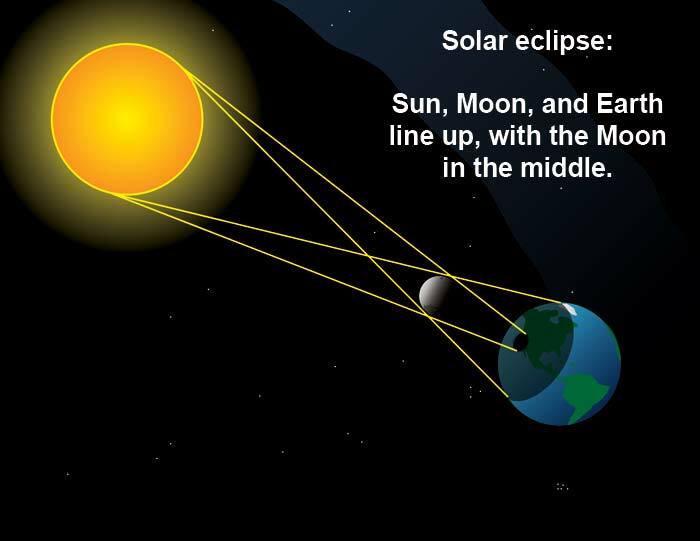 Simple common sense ought to tell anyone that when the sunlight is so obscured by the moon as shown in the preceding diagram, something extraordinary may be happening under the radar. Certainly, the animal kingdom often reacts with alarm and self-protective behavior because they get it instinctively. Human beings also used to get it. That was until modern science took over and banished the ancient wisdom from Western civilization. Were a retrospective scientific study to be undertaken to examine the correlation between total solar eclipses and major events on Earth, the history books would be replete with examples of causation. Such a formal research project would likely never be funded or attempted, but that doesn’t mean common folk haven’t made their own accurate connections over millennia. It really doesn’t take a rocket scientist (or astrophysicist) to see the correlations between heavenly events, like a total solar eclipse, and the various mundane mishaps and misfortunes that regularly occur in their wake. There is absolutely no reason to fear an eclipse or await its coming with apprehension. They are meant to be respected for the unique message that each one delivers. If a total eclipse occurs right overhead, this can be a sign that something hidden will soon be uncovered. This process of unveiling or revelation can happen on multiple levels. For instance, a hidden food allergy can be brought to one’s attention; or an employee who has been stealing from the business can be exposed. Just like the light of the luminary that is blocked and then unblocked, a long concealed truth can be revealed in the blink of an eye. It’s actually well known in spiritual astrology that both the solar and lunar eclipses that immediately precede human birth (also known as the prenatal eclipses) colors the birth chart and provides valuable information about the destiny of the individual. The particular astrological sign associated with the eclipse is quite telling and especially conveys understanding about the areas of challenge and/or difficulty in one’s life. The occultation of either luminary (sun or moon) in a certain constellation also indicates much about the deeper purpose of the soul as it journeys through this realm of existence. What’s the best way to conduct oneself during an eclipse? In light of the “Special Note”, it might be intuitively obvious that the single best way to navigate the day of any eclipse is to go inside not outside, both figuratively and literally. It’s best to remain indoors and not be exposed to the physical event itself, if you can help it. If you cannot, then simply do your best to maintain a high level of awareness in your environment. If you find yourself in a busy area or chaotic situation, be especially conscious of your surroundings. Accidents and the like can increase in number and intensity both before and after an eclipse. Once you are already inside your home or office, the sages of yesteryear always encouraged seekers to do their spiritual practices. Some people pray or chant, others meditate or contemplate, and some perform good deeds or make charitable offerings. The period of the actual eclipse is a particularly auspicious period to perform these and other spiritual practices which connect you to your Higher Self and/or Highest Power. Whatever religion you belong to or spiritual tradition you follow, it’s really very good to use the eclipse period to advance yourself on your spiritual journey. With the palpable diminution of luminary light, nature itself becomes quiet and inactive. The subtle energies, both inside and outside, become conducive for going inward. It’s like the whole world is being set up for a short meditation retreat; something very few people ever take time to do in the Internet Era (aka the Information Age). This graphic shows where the solar eclipse will be the most intense throughout the USA. 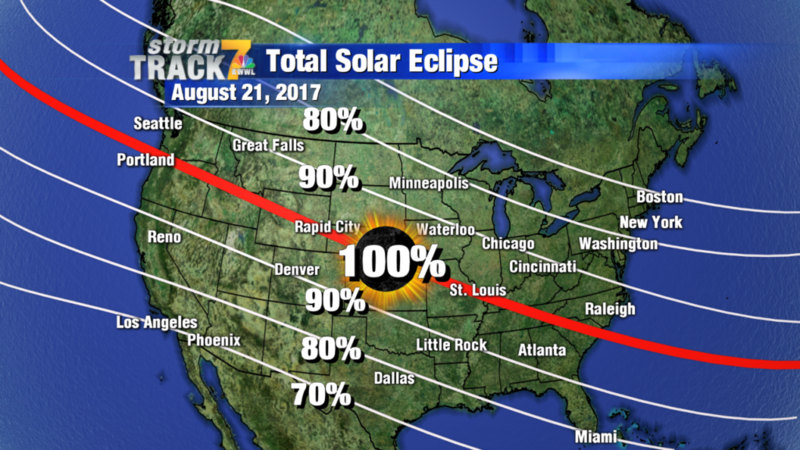 The thick red line (@100%) shows the path of totality which cuts a 70 mile wide swath across the entire country. With much talk about a looming World War III, the American people would be well advised to use the upcoming period to pray and meditate for world peace. Virtually the entire US Congress has been stampeded into a war posture against Russia which has committed no offense. The Neocon warmongers persist in making patently false accusations about Putin’s Kremlin. In so doing they are quite purposefully setting the stage for a regional war that would likely evolve into a global conflict or hot phase of WW3. Only the US citizenry can register their extreme dissatisfaction with their leaders sufficiently so that they see the light. Consciously working with Monday’s solar eclipse in a prayerful way can help immeasurably in this particular regard. The truth about Russia, as well as about those political forces who are recklessly promoting war, need to be revealed post-haste. Only the revelatory light of truth is strong enough to expose the plots and conspiracies which are relentlessly pushing this nation to war. How the American people respond to this solar eclipse will undoubtedly have a major impact on the direction of this nation. Not only will it have a very profound and pervasive influence on the USA, it will affect countries who are considered either friend or foe. Hence, it is of paramount importance for people in all 50 states to come together and use this sacred time in a righteous manner. Not only is the very future of this constitutional republic at stake, so is the fate of the planetary civilization. The more souls who read this edifying essay, the more who will orient themselves in the best possible way to what is truly a defining moment in U.S. history. Therefore, the CCRG highly recommends that this post be disseminated far and wide, and as quickly as possible. Reaching a critical mass of Americans can pave the way for a much brighter future for all of humanity. Should the American Republic break free from the chains of Deep State, the whole world would change in a day and a night. 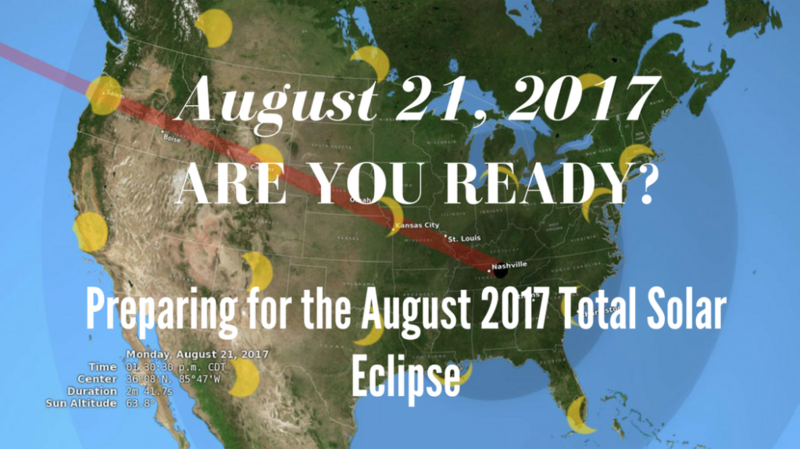 Eclipse Prep: Everyone needs to read this!